Bryce Aron Max Harper (born October 16, 1992), right fielder, is the right fielder for the Philadelphia Phillies. He has played in Major League Baseball (MLB) for the Washington Nationals. The Nationals selected him with the first overall pick in the 2010 Major League Baseball Draft. As a free agent during the 2018–19 offseason, he signed a 13-year, $330 million contract with the Phillies. Harper's deal is the richest contract in the history of North American sports. Harper won the 2010 Golden Spikes Award, awarded annually to the best amateur baseball player. Going into the 2012 season, baseball prospect-watchers, including Baseball America, MLB.com, and Baseball Prospectus routinely ranked Harper as a top-3 prospect. He made his MLB debut with the Nationals on April 28, 2012, at just 19 years old. Harper was selected for the 2012 All-Star Game, becoming the youngest position player to be selected. He has been touted as a "five-tool player". He won the NL Rookie of the Year Award in 2012, and tied for the NL lead in home runs in the 2015 Major League Baseball season. He was named the National League Most Valuable Player for 2015 by unanimous decision of the Baseball Writers' Association of America, the youngest MLB baseball player to ever do so. In 2017, his season was derailed by a slip on the first base bag which caused a knee injury in mid-August and heavily affected his play in the postseason. 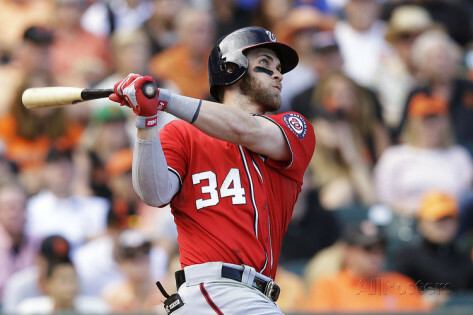 When 2012 National League Rookie of the Year Bryce Harper made his as a MLB baseball player debut on April 28, 2012 at age 19, it was hardly a surprise. He had been pushing toward an early launch to his career for some time. For example, he earned his GED following his sophomore year at Las Vegas High School so that he would be eligible for the June 2010 amateur draft. No sense spending another two years at LVHS. Bryce was drafted first in the 2010 Major League Baseball Draft by the Washington Nationals. He was the Nationals' second consecutive number one pick - they had drafted Stephen Strasburg in 2009. Although he had predominantly played catcher, the Nationals drafted him as an outfielder to extend his career and to accelerate his development. 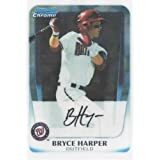 Harper lived up to his billing in his first minor league assignments and by spring of 2012 he had advanced to the Nat's AAA team in Syracuse. After a strong start, he was called up to the majors on April 27, 2012, when Ryan Zimmerman was placed on the DL. The nineteen-year-old outfielder made his MLB debut the next day against the Los Angeles Dodgers. An instant fan favorite, wowing them with his all-around play, he certainly seemed ready for the big time.¹ For his career stats, click here. 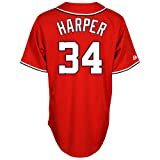 Featured here are Bryce Harper posters, photos, giant collectibles and apparel.